When in Prague, I was surprised that all but one of the fairly numerous beggars I saw were apparently able-bodied young men. These two were typical examples. I don’t know why they were out begging when others were not visible? 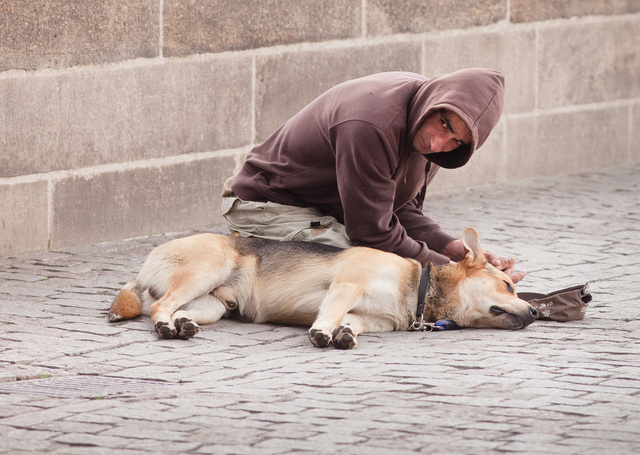 Could be that shelters prohibit pets, could be that they prohibit drugs or alcohol, could be that these men are transients, could be many reasons…but I am so used to beggars being more typically old folks, women with kids and others less immediately considered capable of fending for themselves. And people did give fairly generously to them. Any insights? 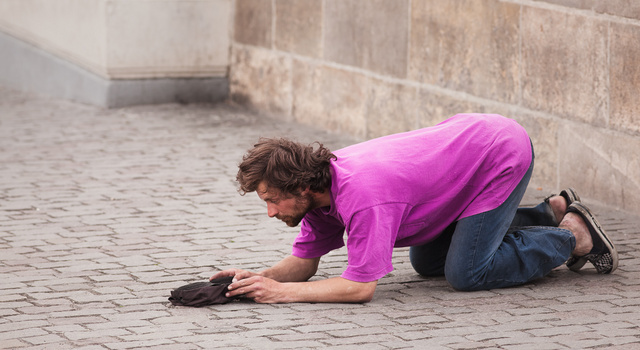 Unlike US pandhandlers who are usually confrontational, Czech beggars had a ritualized manner of bowing deeply enough to keep their faces mostly covered, with hat or bowl held out with both hands. This entry was posted in interesting people and tagged begging, Czechia, panhandling, Prague, travel. Bookmark the permalink. the ritualized way they do it sounds familiar. Oh probably because I read about it in fantasy novels. Might have read it in a history book as well but I’ve forgotten so much it’s hard to tell..
Oh and I’d have given to the guy with the dog. If only because I prefer the company of my dog to most people. Last time I ran into beggars like that was in San Fran in ’87-’89, met several able bodied on the streets, usually a few feet from each other on 3rd. But like you say, they were very up-in-your-face type. What’s the employment scene in the Czech Republic? I saw similar beggars in Edinburgh, Scotland. They’d always be set up with a blanket over their legs for folks to toss money on. They always looked well feed. Usually, they would mind their own business, but they’d try to engage you in conversation if you looked at them and made eye contact. Never pushy for money though like in NYC. Eventually some local friends explained the situation to me. They were all junkies. They government keeps them supplied with methadone so they don’t run around robbing people to buy smack (usually), so they just sit around and beg for enough to buy food, beer, and dog food if they have a dog with them. Don’t know if this would be the case with the guys in Prague. As for Scotland, the gun laws there are as onerous as in England, but from what I saw, crime was lower. The people have bought some measure of safety by pacifying the druggies (still some muggings and stabbings, especially if you walk places you shouldn’t at night), but boy does it cost them–high taxes on everything so that it’s cheaper to buy kilts and whiskey HERE once it’s been imported to the states VAT free. Quite the choice–freedom and the ability to defend yourself, and lower taxes; or no freedom, no way to defend yourself, and high taxes to (hopefully) buy off some of the criminals. When I was in Cologne, there was this old, rather “weathered” looking fellow who stood near the trash and recycle bins right between the train station and the cathedral. When someone walked up with something that had a refund (“Pfand”), he would modestly gesture to him, and they would give him the bottle/can/whatever, which he stuck in a large sack. Over the course of my trip, I gave him three bottles (Euro 0.30 total, I think). I think that old guy must have done pretty good for himself. I’m also certain the homeless/needy in Michigan made sure the areas around them were free of soda cans/bottles for much the same reason. I wonder what their safety net is like there. Begging is a profession in some places. They even have their designated territory and pay protection to their friendly local org crime reps.
Based on the looks of the two guys in the photos, I’m betting it’s their hobby. Physical viability can completely disguise mental ineptitude. Also, you could have enough mind and body to successfully defend for yourself at a healthy survival level, but be so completely emotionally dead you are unable to offer anything more to the world outside your compulsion to fend for yourself alone. It could also be these souls seek this experience, dependence on the kindness of strangers. There’s a strange vulnerability to being entirely subjected to the random will of god. I know the Bible tells us we should help those in need, but I’ve seen too many practicing their disabled walk or carrying the cane like a stick when they were heading home. In San Antonio some were found that were making $50K+, tax free, from begging on the right street corners. Now my charity goes to groups helping the homeless and indigent. Which is why you should get to know your neighbors, the people on your block, etc. So you can help them before they become homeless. Help doesn’t always (or even usually) mean financial assistance. Help forming a budget, a friendly ear to talk to and work out some mental/emotional issues, a hot meal when they are sick, a cold beer when they are lonely. And maybe work a miracle or two. Most of thebeggars i the eu today are romanian gypsies that do the begging as a chosen line of work. They can make considerable money from it. I heard an interview a couple of months ago where a man said that if he continued to make the kind of money he did begging in sweden he would beable to buy a house for his family back home in three years. Obviously, to afford traveling 2000 miles from home to work as a beggar, you cant have been destitute to begin with. Beggars in Austin, TX use the technique of waving a sign at intersections to get money from drivers. They sleep on the paved areas under road bridges, and are mostly junkies addicted to meth or other drugs. The city tolerates them and has many programs for their assistance. In Round Rock, in a different county just up the highway from Austin, the highway bridges were built with very sharp 6″ limestone rubble underneath, instead of flat paving. The police actively encourage them to move on if they appear, and arrest them for drugs or other violations if they don’t. There are no beggars on Round Rock street corners. First guy’s a heroin addict. The second guy’s dog looks groomed and well-fed.